With all my bits of work going on and receiving emails to contact people about commissions, I thought I would just say that my order book is open now for 2015. I like to give time to each piece I make and if it is needing framing that can be up to a two week process, as I always get my work professionally framed. 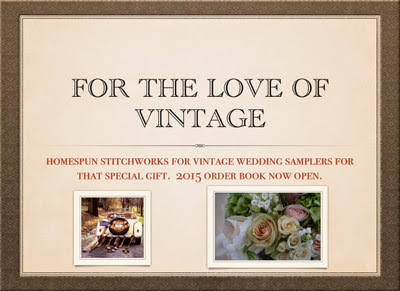 I will be taking orders now for vintage nursery samplers and wedding samplers. They take some time to stitch and I would not want to disappoint anyone. 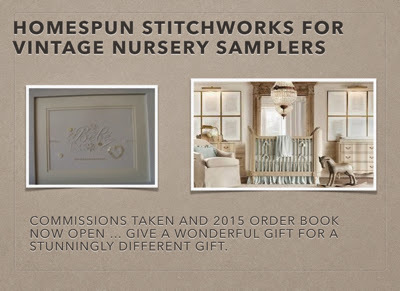 If you know of one of these special events and are thinking about getting someone one of these as a gift then please email me at homespunstitchworks@yahoo.com and we can chat about your needs, prices and time scales. All of them start with beautiful vintage linen as the canvas and from there we can discuss the simplicity of the design and embroidery. I only undertaken so many of these a year with the other work that I do so not to be disappointed please contact me for a chat. Hope you all have a great day and Happy Stitching!